My husband and I recently took a cruise to Norway to see the Northern lights. 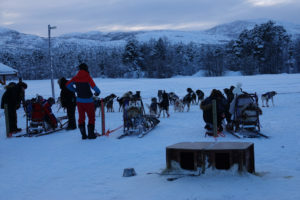 The trip took us 200+ miles into the Arctic Circle. 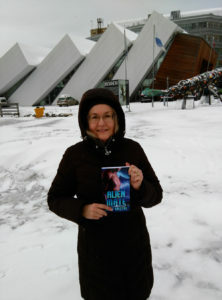 My science fiction romance, Alien Mate, which is set on a planet caught in an ice age, went along to experience Arctic temperatures and a snowy, icy climate. For the March 23 Freebie Friday, I’ll be donating this Arctic traveler to one lucky winner! (To be notified of the drawing, subscribe to my newsletter and you’ll get an email.). We did see the Northern lights and discovered that they are unusual in that the photos of the lights are much more dramatic than what the eye sees. To the eye, the lights appeared like swirling light green, almost white clouds in the night sky. In photos, the lights are vivid green (sometimes purple & red) swirls. 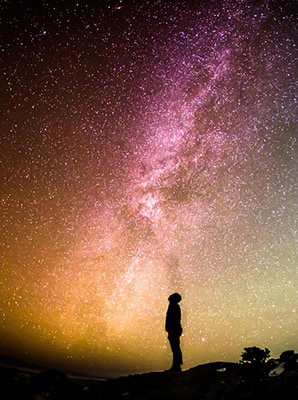 The longer exposure of the camera lens allows colors the eye can’t see to be captured. My husband took photos, but he was working with a new camera, and wasn’t able to get it focused. So all his photos of the lights came out blurry. Cruising through an arctic Norwegian fjord. 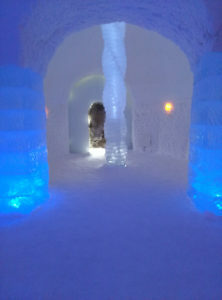 One of the coolest (no pun intended) things we did was visit an ice hotel, the Sorrisniva, in Alta, Norway. The hotel is constructed of snow and ice in November. It lasts until about May, when it melts. Then in November, it’s constructed again. Each year, the hotel has a different theme. This year it had a Viking theme. 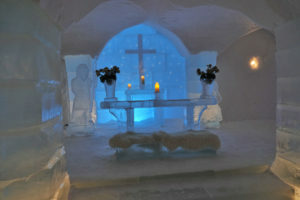 The hotel rooms and suites have beds made of slabs of ice, covered by reindeer hide. The temperature is below freezing inside. 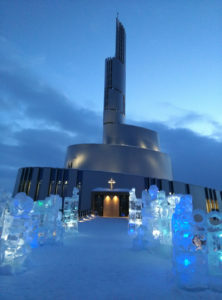 There’s an ice bar and an ice chapel, where many people get married. 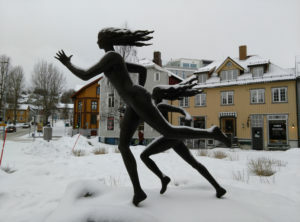 Adjacent to the ice hotel is a regular hotel with regular rooms. You can stay in the ice ones, but it would be something done more for a lark than comfort. The Polaria, a museum in Tromso, is supposed to resemble ice floes surging onto the shore. 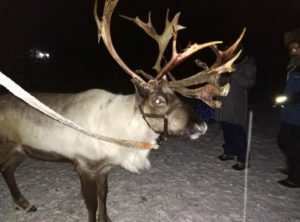 We went reindeer sledding in Tromso, Norway. 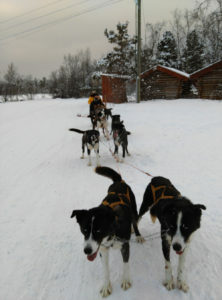 The reindeer sledding was fun, but the dog sledding in Alta, Norway, was an e-ticket ride! The dogs love to run. 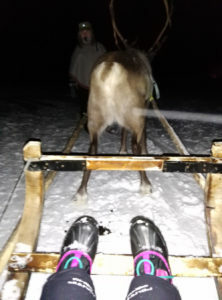 A driver stands on the back of the sled and brakes to slow them down! How cold was it? 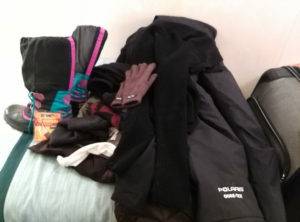 The temperature ranged from a daytime high of about 14 F to to 34 F, but sometimes there was a wind chill factor involved. The ship’s pipes froze and broke, and they had to shut off the “switchboard” that controlled the heat, so some of the public areas and cabins did not have heat for a day and a half. Our cabin was fine. Before boarding the ship and set sailing for Norway, we spent a week in London. (The ship left out of Southhampton). Next up on Friday: Alien Mate does London! Available on Amazon, BN, Kobo, iBooks, and Google Play. Alien Mate 2: Alien Attraction is coming soon! 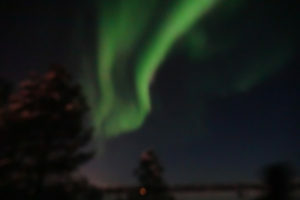 Last, but not least, here is one of the blurry, out-of-focus Northern Light photos. To the eye, the lights looked white. 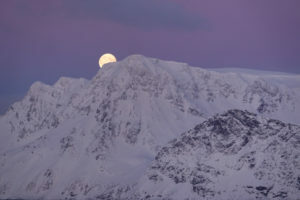 This entry was posted in Life 101, Special promotions and tagged Alien Mate, alien romance, aliens, Alta, Arctic Circle, Atlantic Ocean Road, book promotion, Cara Bristol, Cathedral of the Northern Lights, cruise to Norway, dog sledding, Ice hotel, northern lights, Norway, Polaria, reindeer sledding, Sorrisniva Igloo Hotel, Stavanger, traveling, Tromso. Bookmark the permalink. 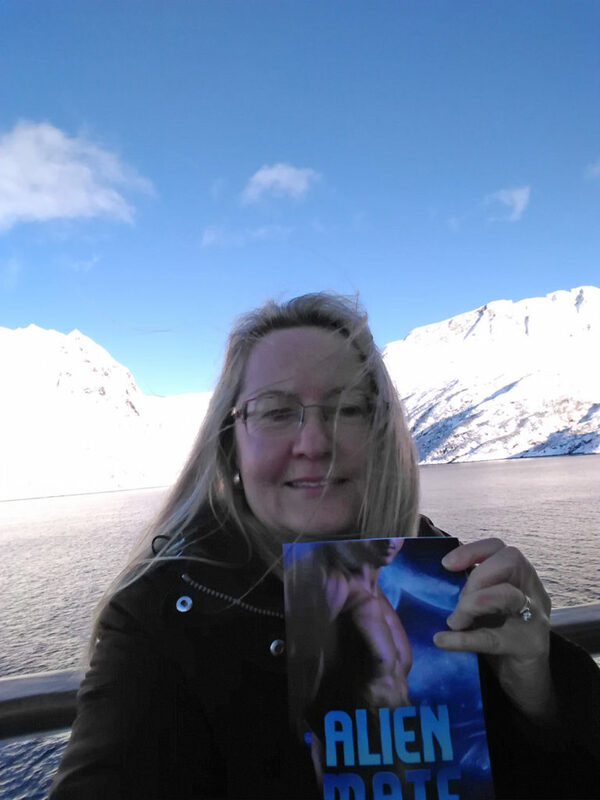 22 Responses to Alien Mate goes to the Arctic Circle! Pictures! Some great pictures, Cara. Thanks for sharing them. What a great experience. Thanks, Rachel. It was a great trip. The scenery was stunning–and it really wasn’t that cold. We were gone for almost 3 weeks. It is nice to be home, but we’re looking forward to our next big trip. What an amazing trip and fabulous fodder for the next Alien series book! Oh definitely! It was great research! You really sold that adventure. I hate the cold, but I’d love to take that trip. Perfect setting for displaying your book also. Before we had left, we had temps of -12F here in Missouri so 14 F didn’t seem that cold. 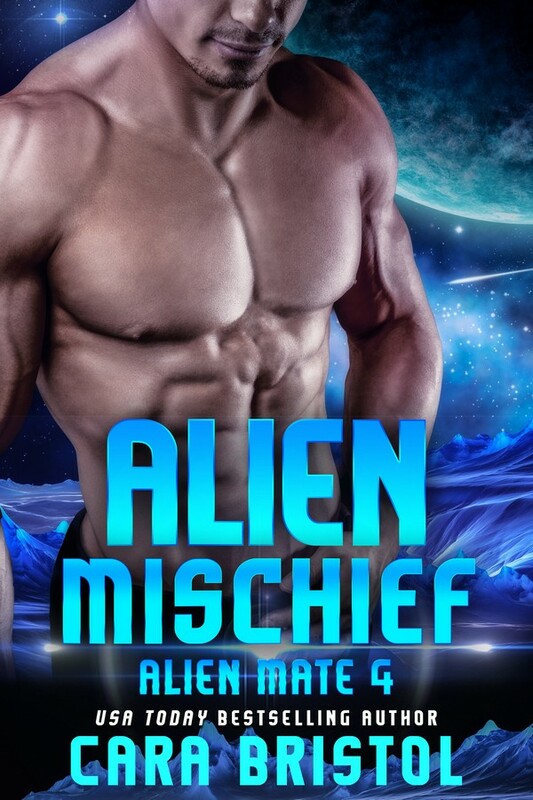 The timing turned out to be perfect with Alien Mate, the Freebie Friday giveaway, and the upcoming release of the next book in the series, Alien Attraction. We’re talking about our next big trip in 2019, and we’re thinking either of Dubai, Africa or Australia/New Zealand. Re: Your book. I’m sure your tale is hot enough to keep even the arctic circle warm. Right? Yeah, I won’t say the lights were disappointing, but photos capture the image much better than the eye. 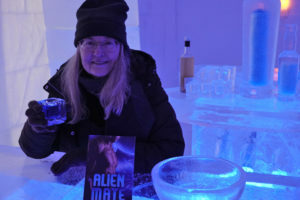 And, ha ha, I’m lucky Alien Mate didn’t melt the ice hotel. Thank you! We used to go snowmobiling, and we brought our old snowmobile suits. That made a big difference. What an amazing experience. Thank you for sharing with photos, with us. You’re welcome. Thanks for visiting and commenting. Hello Cara! I enjoyed looking at your photos, very beautiful. Thanks for sharing. The pictures of your trip are absolutely stunning. 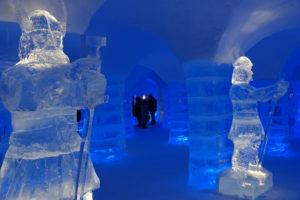 I have always dreamed of going to the ice hotel since hearing about it. 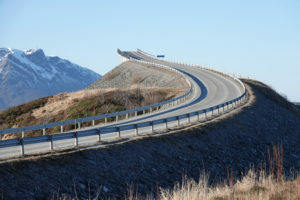 I saw it on a Travel show on TV. So I’m incredibly jealous. Thank you so much for sharing your pictures. They are incredible. Thank you! I saw an ice hotel on TV, too, which is what made me want to see it. Thanks for the giveaway. 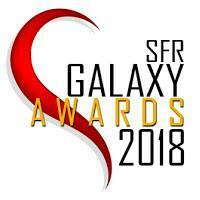 Fingers crossed to win! Oh the ice, hotel is fun! FYI, I wouldn’t recommend sleeping there, though (although you can). It really wouldn’t be comfortable. However, there is an “regular” lodge next to it. 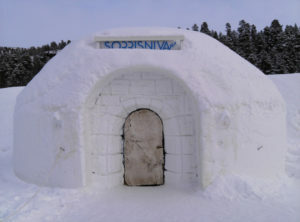 The Sorrisniva, which we visited, is just one ice hotel. If you Google “ice hotel,” you’ll come up with a list of them.